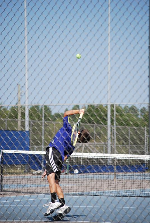 You have clicked on the premier tennis teaching ACADEMY in the Cabarrus county. The program is directed by Chad C. Oxendine. His certification as a USTA High Performance Coach (Presently 1 of only 34 in NC, the ONLY in Cabarrus County) ensures your game is on a path of excellence (Mattthew 7:13-14. His Professional 1 status with the USPTA ensures your dealings are upright and of highest professional standard. Through on & off court coaching, video analysis, fitness training, individualized personal goal setting, etc., you will stretch your God given talents to their greatest limits. Our goal is to create an environment that will expose families to the game of TENNIS. From the young child who has given up on athletics, to the adult who tried tennis years ago, and can fall back in love with the game. We are in daily contact with people who have seen tennis in one form or fashion, but do not think they can ever play successfully. AMP TENNIS, LLC was created to give all levels of players the opportunity to play tennis. It doesn't matter if you are a beginning player, a player who wants to give it one more shot, or a player who wants to stay plugged into the game. These opportunities come in the form of specialized programs for adults and juniors. 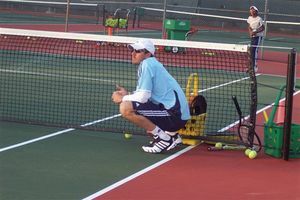 Adults have the option to participate in clinics year round, weekly men and ladies workouts, or community singles and doubles leagues set up by area organizations and USTA tournament play. Juniors have the opportunity to be a part of the AMP Junior Star Tennis Academy. 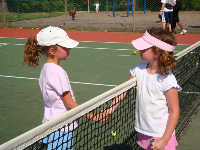 The Academy gives young people the opportunity to see tennis portrayed in a fun and exciting competitive environment. With USPTA and USTA assistance, young people participate in a school year calendar-based schedule of events. Progression in the ACADEMY is based on individual goals and communication with parents on a quarterly basis. The number one goal of the Academy is to expose young people to the game of tennis in a Jesus Christ centered environment. "the sport for a lifetime."